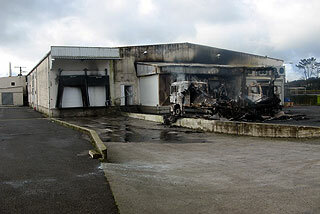 Santa Comba, Galicia, Spain - Animal liberationists touched off a more than $6 million slaughterhouse fire and liberated 160 cows. Investigators believe that the arsonists had detailed prior knowledge of the facility. A police spokesperson said "the fact that the intruders propped doors open with tape to allow live animals to escape while they simultaneously set fire to key areas of the property is definite proof that they knew the place well."